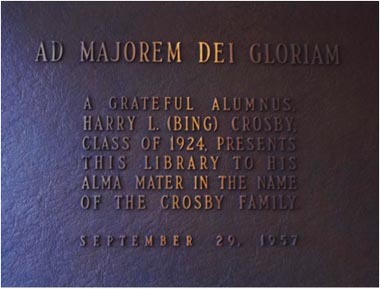 In the 1950's, Gonzaga recognized the need of a good library, and alumnus Bing Crosby became a major supporter of their cause. The library is now called the Crosby Student Center and one room is dedicated to the memory and memorabilia of Bing Crosby. In the mid-1950s, Gonzaga University was in need of a library building, and Bing Crosby was a major financial supporter. He contributed to the library building campaign by organizing a television show and giving the production rights to Gonzaga to secure funds for the library. The show, starring Bing, Frank Sinatra, Louis Armstrong, Bob Hope, and Rosemary Clooney, was sponsored by the Ford Motor Company to introduce its new "car of the future." The Bing Crosby Edsel Show, aired on CBS on October 13, 1957 and received an Emmy Award. Although sponsored by the Ford Company, Crosby was able to remind his nation-wide audience that he was a "Gonzaga man" through some skits. He raised $700,000 for the library, dedicating it with the following words: "If I am any kind of a success here or in show business, it is the result of the time I spent at Gonzaga in the elocution, the debating and the dramatic societies... If I am a good Catholic, and I hope I am, it is directly attributable to the influence of the good priests here; and if I am successful, it is because of what I learned here... I am tremendously grateful and I love this school and the people here." The library was later redesigned as the Crosby Student Center, as a need for more space and technology was met with a new building, decades later.